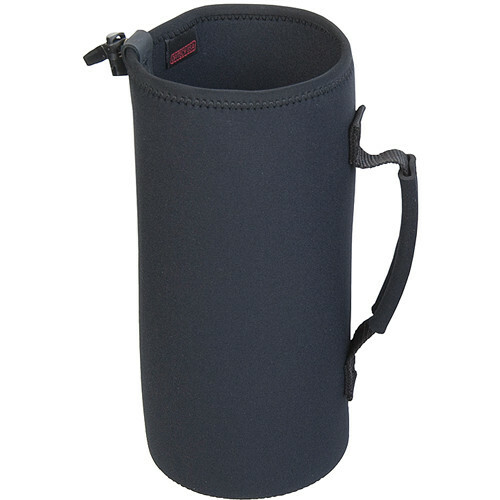 The black OP/TECH USA Snoot Boot Wide Body is a 5.25 x 12" lens pouch with a cylindrical body. It is designed to fit a wide body camera lens. The wide-mouth opening makes it easy to retrieve a lens while the drawstring closure secures it tightly with a spring lock. It features a grip handle for comfortable carrying. Box Dimensions (LxWxH) 11.9 x 7.2 x 1.7"
Snoot Boot Wide Body (XXL) is rated 4.2 out of 5 by 26. Rated 3 out of 5 by Naturelover from Something to keep your lens safe I purchased this lens case for the Tamron 150-600mm lens. I see there is still no any lens case available for this lens, so this one for now works ok. It is a tight fit for this lens but works with the lens collar on. The opening of this pouch do not get closed once you put the lens in, may be the lens is very wide. Also this lens case is only to keep the lens, but is not good for carrying as a separate pouch, neither can be attached to your any other carrying accessories on the photo backpack. Please note that, it will not protect your lens from any damage, as it do. It have any cushion on. Rated 5 out of 5 by Brian G from Good for the Tamron 150-600mm Lens Purchased for the Tamron 150-600mm lens. The material is sturdy enough to safely support the weight of the Tamron with just enough room for the kens and unattached hood. Rated 4 out of 5 by Anonymous from Great Product. For my 150 x 600 lens---It fits great not too tight and not loose, well made and great protection for my large lens.---would buy again. Rated 5 out of 5 by Senior Shopper from Fits like a glove! I bought this Snoot Boot to replace the case that came with my Sigma 150-600C lens. This boot allows good protection without having the bulk of the original case. Now I can put that lens, a Nikon D7100 and Sigma 18-250mm lens in my backpack and go! The quality of the Snoot Boot equals the good quality of all the other Op/Tech equipment I have. The price was very fair, too! Rated 4 out of 5 by Josh from Does what it claims to do Provides a layer of protection for large lenses & similar items. Well made of neoprene bonded to fabric. Does not claim to be either waterproof or dustproof, and isn't. Only negative is the poor drawstring closure - awkward to close fully, and much inferior to the ones found on Zing products (but Zing doesn't make a bag this large). Rated 1 out of 5 by David from Too small for my Nikon 200-500mm This XXL size Boot will not fit on my Nikon 200-500mm lens. I asked B & H if this would fit and was advised it should be ok; it wasn't, I returned it, and as such, this has an unaffordable effect on myreturn rate. Rated 4 out of 5 by Anonymous from Simple yet effective I purchased this lens case to help protect a Tamron 150-600 lens. The cover holds the lens and lens hood fine and offers some additional protection for the lens while it is in or out of my camera bag. Will it fit a Sigma 150-500 with the tripod mount attached? Does a Canon EFS 55-250 is lens fit this pouch? I got this for a sigma 150-500 which appears to be 2x the size of the canon lens. Check the dimensions...i believe you can go with a much smaller case.